Affordable and reliable, the Hoover tumble dryer range features vented dryers, heat pump and condenser dryers to give you the drying power you need. Whether you want a dryer for everyday use or one that you can wheel out and use only as and when you need to, Hoover tumble dryers feature a range of functions that make laundry drying easier. Choose from three types of Hoover tumble dryer. Vented dryers dry laundry in a very short time but require venting via ducting to the outside to remove the moist air. Condenser dryers don’t require any venting and so they can be placed anywhere in the home. They cool down the moist air internally, inside a closed air circuit, and condense the moisture instead. Hoover’s heat pump dryers give you the same unvented convenience and flexibility as a condenser dryer but use up to 50% less electricity. The Hoover range comes in several sizes and capacities so you can choose a dryer that meets your household’s laundry needs. Choose from 7kg to 10kg drum capacity that’s big enough for the whole family’s clothes, towels and bedding. Hoover uses sensor drying to allow you to set the level of dryness you need - iron dry, store dry or hang dry. Once the desired dryness has been achieved, the dryer automatically switches off, protecting clothes from over-drying and saving on energy bills. One Touch control uses the latest smart technology to allow you to control and check up on your dryer from your smartphone. Download the Hoover Wizard app and you can check your dryer, monitor energy usage, operate or delay programmes remotely, as well as download new cycles. 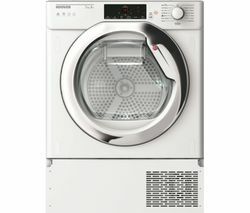 Extra-large portholes make it easy to load and unload large washing loads, and the Rapid 40 setting allows you to dry cotton items like jeans and towels in just 40 minutes. For a wider selection of tumble drying options, take a look at our White Knight tumble dryers and see all Beko tumble dryers for integrated dryer models.